The Peoples Democratic Party (PDP) presidential candidates may just be charade as the Delta State Governor and his Rivers State counterpart, Mr Ifeanyi Okowa and Nyesom Wike have concluded plans on who will be the flag bearer. 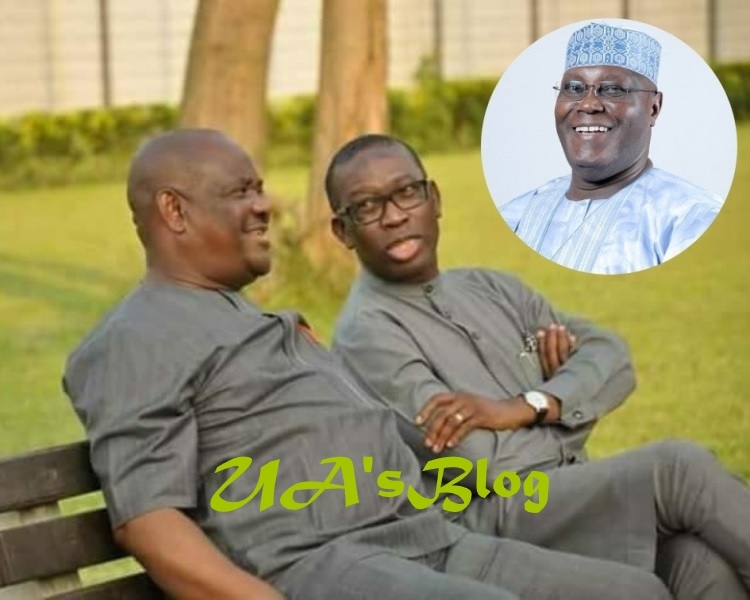 Three very dependable and highly placed sources in Delta and Rivers government house confided in SecretReporters on how the two South South governors are secretly convincing delegates to adopt Atiku Abubakar as the consensus candidate, just as they did during the convention last year December. According to our sources, both governors are the financial war chest running the party and feel they must produce the President or heaven will fall. This medium gathered that Okowa is secretly nursing the ambition of becoming the Vice President in 2023 if PDP wins the presidency next year, hence his reason for secretly supporting Atiku to be the Presidential candidate, where state funds will be deployed to see to his victory in 2019. This move is already known to the Presidency, who detailed security operatives to discreetly monitor the activities of Okowa. Security report on him revealed that he’s banking on the billions from the Paris Debt fund to achieve his aim. The report is what made the Presidency to quickly take back the N40 billion last tranche of Paris Debt fund which had already been paid into the state coffers, SecretReporters sources disclosed. The governor had been unable to tell the state on the status of the fund, refusing to tell anyone that the money left the account back to the Federation in less than 24 hours, thus rendering his N5 billion promise to local government workers untenable. “Ask your friend and principal (referring to Okowa) where the Paris debt fund of the state is. It’s Okowa that made the president order for the reversal. Other states own were merely taken back too, to erase political suspicion, including an APC domain, Imo State. Other states will get theirs after the PDP presidential primaries but Delta State may not get theirs”, a presidency source revealed. Wike’s sole interest we gathered is just to be a kingmaker, without personal interest, as he believes that Atiku is the only candidate that can beat Buhari next year. Both governors according to our sources connived to take the venue of the primaries to Port Harcourt with their plan B as Asaba, if the members kick against Wike’s base. All attempts to reach the two governors Commissioners for Information and their CPS proved abortive, as their lines were busy.